30 Ways to Doff Your Hat is a selection of thirty literary pieces in which Elvira Lindo portrays female artists, painters, writers, actresses, and photographers who pursue their work at the margins of the conventional male canon that looms over society, and who have managed to make their mark doing so. Elvira Lindo, one of the most distinguished figures on the contemporary Spanish scene, retraces her path in life and in art, incorporating her own self-portrait into this pantheon of female artists. The author’s voice is the guiding thread that runs through each of these essays: through her experience, through her gaze, Elvira Lindo invites the reader to analyze the era and the accomplishments of these pioneering women whose brilliance, tenacity, and free spirit led them to blaze new trails for future generations. Throughout history, many women have felt obliged to doff their hat before rules imposed by a society that has isolated them from the male-dominated intellectual community. 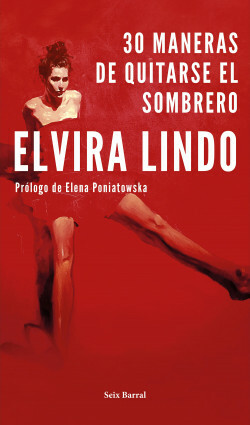 In this narrative mosaic, Elvira Lindo’s astonishing prose reveals her boundless empathy, erudition, and eclectic and inquisitive spirit. Portrayed artists: Astrid Lindgren, Anna Frank, Concepción Josefa Pantaleona, María Guerrero, Elena Fortún, Gloria Fuertes, Adelaida García Morales, Tristana, Louisa May Alcott, Carson McMullers, Patricia Highsmith, Victoria Kent, Alice Munro, Mary Beard, Monica Zgustova, Chimamanda Adichie Ngozie, Margaret Atwood, Edna O’Brien, Joan Didion, Lucia Berlin, Dorothy Parker, Angelika Schrobsdorff, Sally Mann, Joyce Maynard, Marjorie Eliot, Vivian Gornick, Olivia Laing, Nelle Harper Lee, Grace Paley, Elvira Lindo. Winner of the 1998 National Prize for Children’s and YA Literature and the 2005 Biblioteca Breve Prize. María José Obiol, Babelia (El País).